Although not an organized railfan park, this spot is listed due to the amount of fans that visit this location. By far, the single busiest railfan location east of Chicago. Berea was the "X" of the Conrail system. The X is where the four busiest lines of Conrail met. Chicago Line (Chicago to Selkirk, NY), Pittsburgh Line (Cleveland to Philadelphia), and the St. Louis Line (Cleveland to East St. Louis, IL). Today Berea is once again a two railroad town. 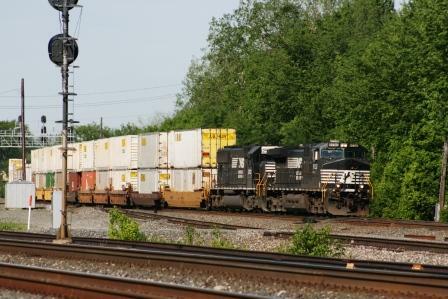 Norfolk Southern operates the Chicago Line west of Cleveland, and the Pittsburgh Line. 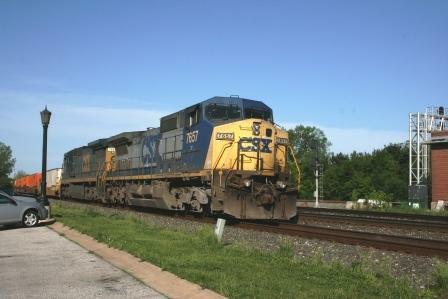 CSX Transportation operates the Chicago Line east of Cleveland, and the St. Louis Line. Today, traffic patterns have slightly changed since Conrail, but only for the better. Berea is busier than ever, NS may run slightly more trains then CSX through Berea, but who's counting when there are about 110+ trains each 24-hours. Every & any kind of train can be seen in Berea (except steam trains). Rail Traffic: Two major mainlines can host every type of train CSX / NS have to offer, Merchandise, intermodal / double stacks, automobiles, coal, grain, stone, coke, dimensional, army trains, the list can go on and on. Amtrak passes 4 times daily (#'s 29, 30, 48, 49) all of these train pass between midnight and 5am. The regional railroad Wheeling & Lake Erie make an appearance a few times a week, days and times on those trains vary. There is no schedule. Beside the constant surprise of foreign power, big excitement can be had from certain CSX freights that pass with brand new GE locomotives in tow going westbound to be delivered to their new owners. This can happen several times a week. As of 2014, late morning has been a usual time for the GE deliveries passing Berea. Food: On site is the Berea Union Depot Taverne; its open for lunch and diner. Food is very good worth a visit! Fast food choices are also nearby. Less than a 5-minute drive is Burger King, some mini-marts and several Pizza joints are not far. Downtown Berea; south of Bagley Road offer other choices. Other fast food and popular chain restuarants can be found on Bagley Road in Middleburg Heights, about 10-minites from the tracks. Parking: Parking at the west end of the train station parking lot. Please be warned, this is private property, please treat it as such. Also KEEP OFF THE TRACKS, local police, and both CSX / NS police forces are very strict about stepping foot on railroad property. They don't mind you watching trains from the parking lot, but that's as far as you go! Trespass on the railroad tracks, and you may get to know the local's a little better then you care too....if you know what I mean, wink, wink! Lighted for evening railfanning: YES. Parking lot lights illuminate CSX trains well, Norfolk Southern trains can only be seen from a few flood lights in the area of Berea tower. Several fans will hang out until 10pm to midnight, as trains are usually non-stop from 8pm until 11pm or later (in most cases). Motels / Hotels: There are several motels in Middleburg Heights that will offer good rates (10-minutes away from the station). There are a few "railfan motels"in the area, but those are pricey. If you are on a railfanning trip, you may want to weight the options, Train watch at Berea from dawn to after dark, or stay in a railfan motel. Believe me, Berea is one of those places when a green signal or headlight will appear every time you’re about to leave. "Ok, just one more.....and before you know it its midnight"! I'd sidetrack the railfan motel in the case of "Berea". Also keep in mind the railfan motels in Middleburg Heights are located on a lightly used line. The Sheraton in Cleveland (airport), although close to Berea, is expensive. That hotel has a distant view of only the Norfolk Southern line (around 60 trains daily). A eastbound Norfolk Southern train is coming from Chicago. 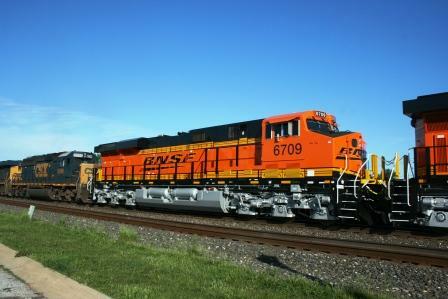 Brand new BNSF 6709 is being towed westbound on CSX, on its way to its new home, out west!